Conclusion – Should You Get The Behringer B-1? The Behringer B-1 has proven itself to be a high-quality microphone with a wide appeal. Many people are in need of condenser microphones to use in the studio. Recording audio is a very sensitive process, and you need to have access to microphones that can get the job done right. This microphone here is very good at picking up soft audio and can be used in multiple ways. 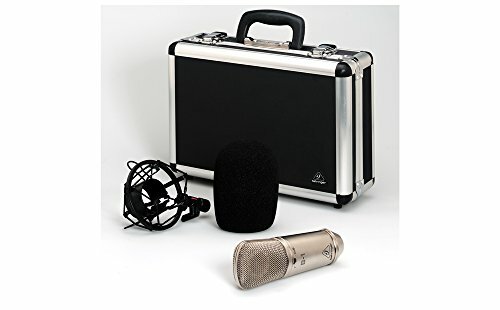 Anyone who is in need of a microphone to help them record various instruments will really fall in love with this product. It isn’t overly pricey, and it is still able to give you very nice results. Being able to record acoustic instruments with the best results is quite important in the studio, so this microphone will prove to be useful to professionals. The cost of the microphone makes it easy to justify purchasing one if you are only an amateur musician, as well. The largest group that this type of microphone is going to appeal to will be musicians. Whether you are a professional musician, or if you simply like to record songs in your free time, this microphone will come in handy. It has the right mixture of quality features, and it is very easy to use. This is a microphone type that will be practical to purchase for just about anyone who wants to record audio. It isn’t uncommon for this microphone to be used in churches, either. Sometimes people will use it to record the worship music that is being performed so that the congregation can enjoy it at a later date. This is also a popular tool for podcasting. 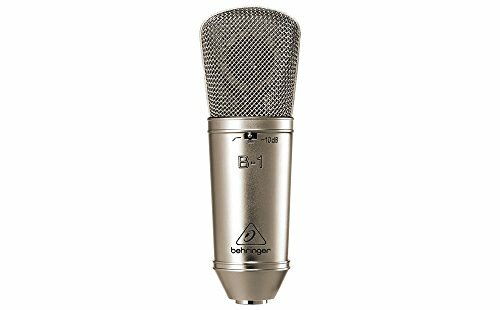 People who need quality microphones to use for their podcast will be able to readily use the Behringer B-1. It is possible to use this microphone for some live applications, but it is mostly going to be a studio tool. It might be useful in the radio industry as well due to its ability to cut down on background noise. Keep it in consideration when you are looking for a microphone that can isolate audio to a high degree. Of course, when you open up your package you will find the high-quality Behringer B-1 studio condenser microphone. This is going to come with a carrying case, a windscreen, and a heavy-duty suspension mount as well. All of the extras that are included here really do make a big difference. The windscreen will make recording audio in the studio even simpler than it would otherwise be. The included carrying case is quite nice too, making it simple to tote the microphone around with you when necessary. The case is foam-padded and is constructed out of aluminum, which allows it to keep your microphone safe. The heavy-duty suspension mount will work swimmingly when you are mounting it in the studio for a recording session. You will find that the features of this microphone are really good. You can count on the Behringer B-1 to provide you with the highest quality recording experience. The wide and flat frequency response of this microphone allows it to pick up tiny details. It is very good at eliminating feedback despite its sensitivity, too. When you want clean audio that really helps all of the details to shine through, then you should reach for this microphone. The cardioid pickup pattern makes it easy to avoid the feedback issues that you will encounter with some lesser microphones. This model can eliminate issues with low-frequency distortion too. The wide frequency response of this model ranges from 20 Hz to 20 kHz, so it really is a very versatile microphone. You can expect noise-free transmission every time when you make use of this professional condenser microphone. To add to this, it has been constructed to be very rugged. It has a nickel-plated brass body that will stand up to regular use without giving you any problems. Being able to count on your new microphone to stand the test of time makes it easier to justify the investment. You won’t have to worry about this microphone being hurt by taking a few bumps, so you’ll be able to rest a bit easier. The cost-effective nature of this microphone is remarkable when you consider how many features it has. It can eliminate background noise to isolate the audio that you want to record. It is also sensitive enough to pick up the small details that other microphones cannot. It is a very good microphone to purchase for professional purposes. If you are a musician who wants to record audio at the highest quality, then this is going to make a lot of sense for you. If the Behringer B-1 is not quite everything that you want out of a studio condenser microphone, then you may wish to consider the Audio-Technica AT2035. This is another popular model that has very similar capabilities, but it may be superior in certain categories. The pop filter that is included with this microphone is very useful and may help you to avoid some issues when recording audio. It also comes included with an XTR cable to connect the microphone directly to your interface unit. Of course, the price of this microphone is slightly higher than the Behringer B-1. The extra accessories are pretty much what is driving up the price. The two microphones are close in performance, and you likely won’t notice much of a difference between the two. They are good options when you need a solid recording condenser microphone. This microphone will prove useful to you if you decide to purchase it. Owning a high-quality studio condenser microphone will be very helpful to anyone who wants to record songs. Musicians will be able to make use of this handy microphone to turn their dreams into a reality. It can provide you with the cleanest sounds, and it will ensure that the recording matches up with your vision. You can use the microphone for other purposes, too. Whether you are planning on purchasing this quality microphone for your podcast, or if you want to use it for your church, it is definitely a worthwhile purchase. It can help you to isolate audio properly while cutting down on background noise. 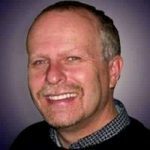 Your recordings are going to sound better than ever, and you will be quite happy with your purchase.